Fulkerson and Shea reported a grading scheme for classifying patellofemoral malalignment in patients with chronic patellofemoral pain. The authors are from the University of Connecticut. Patients with chronic patellofemoral pain. 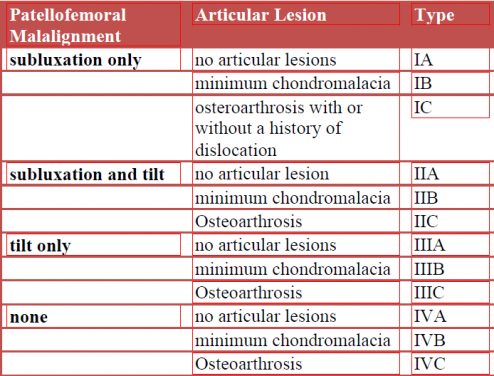 • Minimum chrondromalacia corresponds to Grade 1 or 2 articular damage (see arthroscopic grading scheme for degeneration of articular cartilage). • Osteoarthrosis corresponds to Grade 3 or 4 (large areas of fibrillation or exposed bone.